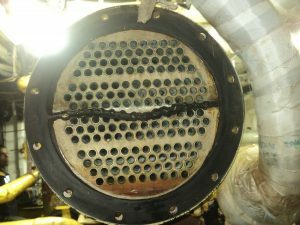 ﻿ How to remove and stop fouling in a heat exchanger. The fouling in heat exchangers and the resulting cleaning effort is a common task in many companies. The reason for fouling and different deposits in water cycle is water with a high amount of solved minerals. High temperature and dirt contribute to the problem. Fouling and incrustations impede the heating or cooling performance of the heat exchanger. The thicker and harder the deposits are, the less heat is transferred. Every heat exchanger includes two sides. On one side there is the product, for example a liquid or gas with a specific temperature. This product is brought to an other temperature level by the liquid on the other side. So it is either cooled down or heated up. In this case we will focus on the cooling waterside in a heat exchanger, as this is one application for the Merus Ring in nearly every project. In some cases we are also able to treat the productside. These are very specific solutions for our customers, because no product is alike the other. Deposits – the result of fouling – forms depending on the amount of total dissolved solids (TDS) in the water, the temperature (change) and the flow conditions. As the waterside is exposed to various external influences biofilm can form easily and fast. In general there are two kinds of deposits in the heat exchanger which support the growth of biofilm. First of all limescale or other minerals which settle or rust and corrosion due to aggressive substances in the water. Gas (CO2, H2S) or certain bacteria (SRB), dissolve iron out of steel and lead to corrosion. Biofouling occurs where algae or bacteria enters the cycle with the water and settles at the rough pipe walls (due to deposits and corrosion). Heat exchangers with these deposits need to be cleaned regularly. Therefore the heat exchanger is opened and its parts are cleaned manually, often with chemical cleaning agents. For a big tube bundle heat exchanger this means a production stop for several days. What can Merus do to stop fouling in a heat exchanger?
. If there is fouling on both sides, two Merus Rings are needed at both inlets. If the cooling cycle includes several heat exchangers it is not necessary to install one Ring ahead of each heat exchanger. It is sufficient to install the Merus Rings in selected areas. After the installation deposits which substance is soluble in the liquid are solved and don’t settle anymore. In case of water often minerals become deposits. The Merus technology has the effect of a higher solubility of these minerals in the water. This effect is not limited to watery liquids. On the product side also oily liquids, crude oil or chemicals can be treated. To which degree the solution is applicable to other liquids has to be decided or tested individually. The astonishing result of the water treatment is that the heat exchanger is nearly self cleaning after the installation of a Merus Ring. Numerous cases and customers prove that after some weeks nearly blocked heat exchangers were clean again – without chemical or manual cleaning. The Merus Ring does both – removing existing deposits and stopping new deposition. Therefore fouling is stopped.